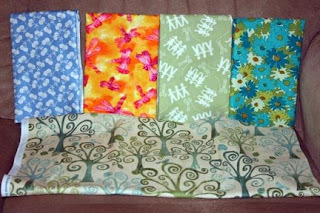 These are the new fabrics I bought at our local quilt shop, Among Friends late last spring. It's the kind of shop that I love - lots of bright, colorful, trendy fabrics. I've gone into shops that sell traditional prints, but I just can't get into the muted colors. This is really funny, because I'm such a muted colors girl in other areas (as I've been reminded of several times recently, I'm all about earthtones). Anyway, as much as I love them, I can't usually bring myself to just buy some fabric off the shelf. It's expensive and I have a hard time justifying it without a project in mind. On this day, I had a store coupon so I bought a yard of the cool tree print shown at bottom and I don't even have anything in mind for it (actually, its earthtoned, isn't it?). The other four prints I found in the shops reduced section. I have a tendency to go through there hoping I'll find Amy Butler on sale, but I doubt that will ever happen. I especially love the white cherries on the blue on the left and the paper dolls in green in the middle. Actually, I went back and bought more of the cherries and used it to make the sunhat from Lotta Jansdotter's Simple Sewing. But that's another post.